Derek Richard Dietrich (born July 18, 1989) is an American professional baseball second baseman for the Cincinnati Reds of Major League Baseball (MLB). He made his MLB debut on May 8, 2013, with the Miami Marlins. Prior to playing professionally, Dietrich starred at St. Ignatius High School in Cleveland, Ohio and played for the Georgia Tech Yellow Jackets. While primarily a second baseman, he has also played left field and third base for the Marlins. Dietrich attended St. Ignatius High School in Cleveland, Ohio. One of the top high school players in the country, he took part in the East Coast Professional Baseball Showcase and the AFLAC All-American game while he was a senior. The Houston Astros selected Dietrich with their first selection, with the 111th overall selection in the third round, of the 2007 Major League Baseball draft. Dietrich opted not to sign, instead choosing to attend the Georgia Institute of Technology, where he played college baseball for the Georgia Tech Yellow Jackets baseball team. He was named the Atlantic Coast Conference's co-player of the week from March 23–28, 2010. He also played collegiate summer baseball for the Wareham Gatemen of the Cape Cod Baseball League. The Tampa Bay Rays selected Dietrich in the second round, with the 79th overall selection, in the 2010 Major League Baseball draft. He signed with the Rays and made his professional debut with the Hudson Valley Renegades of the Class A-Short Season New York–Penn League that summer. In 2011, while playing for the Bowling Green Hot Rods in the Class A Midwest League, he set a team record for home runs in a season and was named a Midwest League all-star. Dietrich played for the Charlotte Stone Crabs of the Class A-Advanced Florida State League and Montgomery Biscuits of the Class AA Southern League in 2012. After the 2012 season, the Rays traded Dietrich to the Miami Marlins for Yunel Escobar. The Marlins assigned Dietrich to the Jacksonville Suns of the Southern League at the start of the 2013 season. Following injuries to Donovan Solano and Chris Valaika, the Marlins promoted Dietrich to the major leagues on May 8, 2013, and he made his MLB debut that day. He was optioned back to Jacksonville on July 22. In 2014, Dietrich served as the Marlins' starting second baseman. They optioned Dietrich to the New Orleans Zephyrs of the Class AAA Pacific Coast League in June due to his poor defense. After the season, Dietrich played winter baseball in the Dominican Professional Baseball League, but his season ended prematurely due to an ankle injury. Dietrich began the 2015 season with New Orleans. The Marlins promoted him to the major leagues on June 12. In 2016 he batted .279, and was 2nd in the major leagues in hit by pitch, with 24. He had his best offensive season in 2017, posting career highs in games played (135), at bats (406), runs (56), home runs (13), RBI (53) and walks (36). In 2018 he batted .265/.330/.421. He tied for the major league lead in hit by pitch, with 21. Dietrich was designated for assignment on November 20. After clearing waivers, Dietrich elected free agency on November 26. In a game on April 7, 2019 against the Pittsburgh Pirates, Dietrich hit a second-inning, two-run home run that landed in the river off of Pirates starter Chris Archer. As the ball flew over the wall, Dietrich stayed at home plate and admired the ball for a few seconds as it went over before he started running. When Dietrich returned to bat in the fourth inning, Archer intentionally threw a ball behind Dietrich’s back. Home plate umpire Jeff Kellogg issued Archer a warning, much to the irritation of Reds manager David Bell. As Bell argued with the umpire, benches cleared and Yasiel Puig attempted to throw punches at the Pirates players. In the end of the incident, five people were ejected, Bell, Puig, Reds southpaw Amir Garrett, Pirates setup man Keone Kela, and Pirates closer Felipe Vazquez. When play resumed, Dietrich was struck out by Archer, but got another two run home run, also hit into the river, later in the game off of Pirates pitcher Nick Kingham. Dietrich's grandfather, Steve Demeter, played in Major League Baseball. Dietrich credits his grandfather with teaching him about the game of baseball. In his spare time, Dietrich is a juggler, performing at community events and hospitals for children. As of 2018, Dietrich is currently in a relationship with Puerto Rican tennis player Monica Puig. ^ "Dietrich's mom has seen a lot of baseball". StarNewsOnline.com. August 10, 2006. Retrieved December 5, 2012. ^ a b "Astros corral high school infielder | MLB.com: News". Mlb.mlb.com. Retrieved December 5, 2012. ^ a b c d Rallo, Curt (January 2, 2012). "MWL notes: Dietrich on right track | MiLB.com News | The Official Site of Minor League Baseball". Milb.com. Retrieved December 5, 2012. ^ "Georgia Tech's Dietrich Named ACC Co-Player of the Week". Wctv.tv. March 29, 2010. Retrieved December 5, 2012. ^ "Derek Dietrich, former St. Ignatius High School star, drafted by Tampa Bay in second round of Major League Baseball draft". cleveland.com. Associated Press. Retrieved December 5, 2012. ^ a b "Marlins acquire infielder Derek Dietrich from Tampa Bay for infielder Yunel Escobar | marlins.com: News" (Press release). Miami.marlins.mlb.com. December 5, 2012. Retrieved December 5, 2012. ^ "Marlins call up Derek Dietrich to start at second base | HardballTalk". Hardballtalk.nbcsports.com. April 29, 2013. Retrieved May 29, 2013. ^ "Dietrich, drafted by Rays, happy to be with Marlins | marlins.com: News". Mlb.mlb.com. May 24, 2013. Retrieved May 29, 2013. ^ "Marlins demote Derek Dietrich because of his defense – HardballTalk". nbcsports.com. Retrieved June 16, 2015. ^ South Florida Sun-Sentinel (December 17, 2014). "Ankle injury ends Miami Marlins' infielder Derek Dietrich's winter ball season". Sun-Sentinel.com. Retrieved June 16, 2015. ^ "Miami Marlins call up Derek Dietrich to add infield depth". Miami Herald. Retrieved June 16, 2015. ^ Todd, Jeff (November 20, 2018). "Marlins Acquire Nick Anderson, Designate Derek Dietrich". MLBTradeRumors.com. Retrieved November 20, 2018. ^ Todd, Jeff (November 26, 2018). "Derek Dietrich Clears Waivers, Elects Free Agency". MLBTradeRumors.com. Retrieved November 26, 2018. 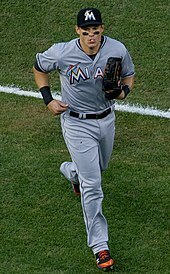 Wikimedia Commons has media related to Derek Dietrich. This page was last edited on 21 April 2019, at 22:50 (UTC).